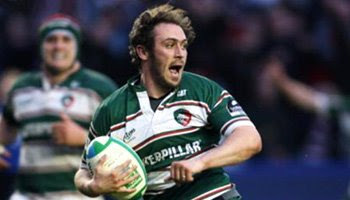 A packed Walkers Stadium were treated to a thrilling finish as their Leicester Tigers snuck victory in the final minute against Bath in Saturday’s Heineken Cup quarter final clash. The match was as intense as you’d expect to see in the knock out stages of a big tournament, with a few crunching tackles that stood out. The first of which was 6ft7 Bath wing Matt Banahan smashing Tigers fullback Geordan Murphy. Banahan lined up and hammered Murphy, who did well to get up from the huge knock. Alesana Tuilagi once again showed his power, but this time it was with a dreadfully unnecessary hit on Bath fullback Nick Abendanon. Abendanon went off with a shoulder injury a few minutes later. The high point of the match was of course the late winning try, which came with less than 50 seconds left till full time, and the scores deadlocked at 15-15. Frenchman Julien Dupuy looked to feed Sam Vesty for the drop goal attempt, but decided it wasn’t on. His delay led to a gap opening up for him to dart through, before rounding the covering defender superbly. Dupuy’s piece of magic booked the Tigers a place in the semi-finals in which they’ll meet Toulouse’s conquerors Cardiff at the Millennium Stadium. definitely should of included some play from Shontayne Hape in that game he was immense. His line break for the try, his tackle on Tuilagi into touch and his general play was top class. Hape was alright, but as I read somewhere, the was more chance of a dodo walking out with teh ball when he took it into contact. Good break though. Banahan cruncher! Tuilagi's was off the ball. Deserved a penalty. But you could see he was commited from the start though. And of course, Dupuys try was a little sprinkle of magic to separate these class sides. Fantastic quick thinking and great step. In the end it was very close, but Leicetsers tireless work at the breakdown and in defence won the match. They fought for EVERYTHING and turned to much ball over. For that determination and spirit, they deserved the win. "was committed the whole way." Keep your head up and take a look. He was a few yards from the man when it was evident the ball was not going to him. Tuilagi will be cited for that hit, especially because of the injury it caused. Tuilagi is a ravenous beast! I'd hate to be his opposite number. Good result for the boys tho. Too bad for Bath! ouch by Tuilagi, feel sorry for the guy going off though, especially as it wasnt a legal hit. good game,leicester just about deserved it in the end.butch james really needs to sort himself out and get a sports psychology book or something though!he must be the most temperamental player i've ever seen! Tuilagi's hit was a definite penalty.could have changed the outcome of the match.i thought murphy did very well in the first one to hold his line and get the ball away even though he knew he was gonna be smashed! haha my reaction: O_O :O when he scored the try ! hahaha. very nice. would like to see full match highlights though! but i just cant see anyone beating munster this yer or in the next couple years. they look liek a class above everyone in europe and in the world. they could go on tour to the super 14 and hockey any team they liked down there. Moody and everyone celebrating in the try zone should be ashamed of themselves. Why should they be ashamed? It clearly shows how much winning this match means to them, and just goes to show the importance of the Heineken Cup. That try was something else... though the commentary team might be right: Dupuy probably couldn't find the guy in the pocket quick enough, but what an improv! Dupuy in the next France squad for sure. It was a superb try but I can't believe no one has mentioned the kick in front of the posts that Vesty missed; absolute sitter. Dupuy didn't know what was happening himself. Everyone was just as confused as he was like but good thinking on the feet. Got a feeling in the second half both team were on a mission to kill each other. bad tackle by tuilangi, just a shoulder smash, but before that there was Banahans on murphy which was also just a shoulder hit so bath cant really complain too much. tuilagi was definitely wrong for that tackle.. but i noticed only one person is commenting about banahan's high hit.. his shoulder clearly made contact with murphy's chin and no one here is complaining... as usual, only the islander should be cited.. i am surprised no one called tuilagi a thug... yet!! AND banahan never even attempted to use his arms... my the double standards!! I´m worried about French rugby, all that money invested, all those players.. and not ONE team got in the semi-finals of the Heineken.. i don´t get it..
why did that guy run into Tuilagi? Sorry, i logged as "Rosina" (My mothers account). i would hate to be on either team one has Tuilagi and on ehas banahan.